430 pages, 5.5" x 8.5"
Who were the greatest individual warriors of all time? 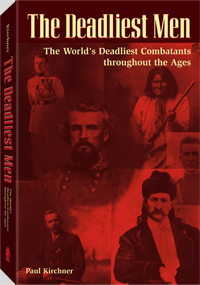 This book profiles 50, including Alexander the Great, Jim Bowie, Geronimo, Bat Masterson, Audie Murphy and Alvin York, as well as such lesser-known figures as Jelly Bryce, the FBI's top gun during the gangster era; Egil Skallagrimmson, the poetry-spouting Viking warrior; Jean-Louis, the Haitian emigrant who became the greatest swordsman in Napoleonic France; Jose "Pepe" Llulla, the New Orleans duelist who owned a private cemetery said to be filled with his victims; La Maupin, the licentious swordswoman who cut a swath through 17th century Paris; and Lance Thomas, the Los Angeles jeweler who successfully defended himself in five armed robberies. These incredible warriors faced overwhelming odds, survived terrible wounds, pulled off hairbreadth escapes and piled their enemies in heaps. Their stories read like fiction but are all the more compelling because they are true.